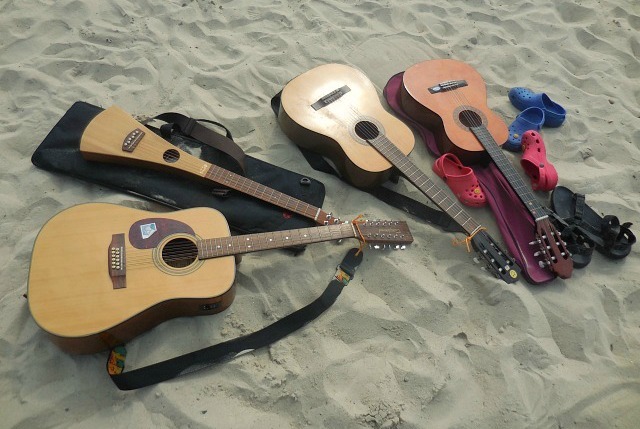 Guitars on the Beach is becoming an annual event in Lyme Regis. This year it’s on Saturday 17th June. Each year they put up a stage and invite everyone to come along to the beach with a guitar. The aim? To create Britain’s Biggest Band and break the record for most guitarists playing the same song together at the same time. We’ve taken part a couple of times. Our first time in 2013 was also the first one ever. The date was the day that Buddy Holly would have turned 77 so Rave On was chosen as the song. A classic but also a simple three chord tune that even a beginner can attempt. As we approached the beach we joined a stream of folk with guitars on their backs or carrying deckchairs. A sizeable crowd gathered. Unfortunately just as it was getting going it began to pour with rain and a powerful storm soaked us through! In the end over 2,200 guitarists played Rave On, not once but twice. And then again as there was a bit of a mix up over the time and they wanted to make sure everybody got into the record! The next year Ian Gillan from Deep Purple had agreed to appear so, along with Rave On, the plan was to play Smoke On The Water. We were more prepared. My husband tuned a guitar for me in such a way that I could easily play the main riff after a lesson and after a fashion. On the Saturday off we went, plus a friend of my daughters and four guitars. The sun shone, Ian Gillan took to the stage, people in boats moored off the shore burned smoke flares, and the event even made it onto the BBC news website. Funnily enough, you can easily spot my daughter and her friend in one of the photos as they were still wearing their “Where’s Wally” hats! Not usual attire I hasten to add, bought along for the Bridport Hat Festival which had been earlier on the same day. We didn’t break the world record (over 6,000 in Poland in 2009) but did beat 2013’s total with 3,325 people. I am now the proud holder of a certificate saying I’ve played in The Biggest Band In British History. On Saturday June 17th the record bid is at 5 pm. There’s more acts to follow and the event is scheduled to go on to 10 pm. The web site has a list of the songs that are going to be played by the crowd, and the chords for them. It’s fun and raises money for charity too. If you are nearby why not dig out that old acoustic, practise a few chords, and go along and join in?